No no, not the little black dress - I'm talking about its sister, the little blue dress. A navy blue dress is a perfect piece to take you from the heat of summer (pair it with a pair of Jack Rogers sandals and statement earrings) to chillier fall days (pair it with a cardigan or jean jacket, loafers, and pearls). If you can layer with it, then that's a bonus! 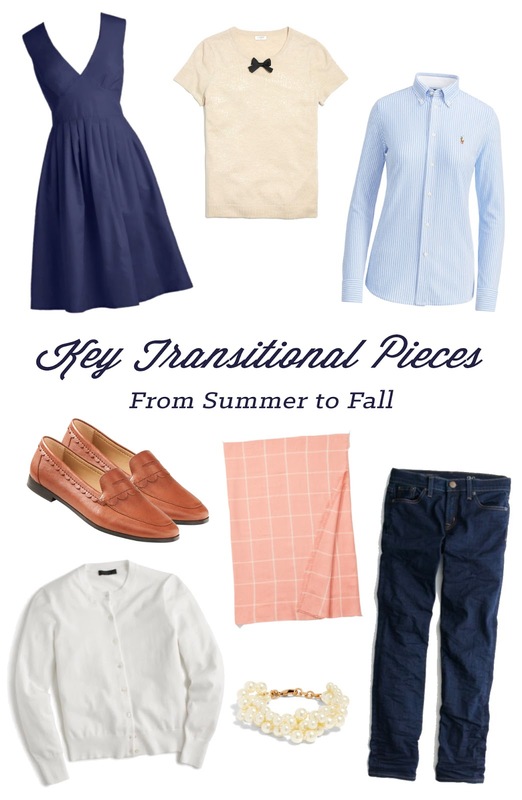 I have a navy scalloped shift dress from J.Crew that I love to wear white oxford underneath in the fall. When it comes to denim, dark wash is the perfect transition from warm to cool. Cuff them and wear them with a flowy white eyelet top and flats in the summer; switch to boots and a sweater in the fall. It looks equally as stylish with richer fall palettes as it does lighter summer colors, while light wash and white denim are trickier to pair in the cooler months. Cardigans are definitely a no-brainer when it comes to layering. The best part about them is that they're more versatile than sweaters in that you can pair them over dresses, and it's a bit more practical to take them off if you overheat. Personally, I'm looking to update my fall wardrobe with a new navy and white cardigan to help carry it over into cooler weather. Boots can be a bit too hot in early fall, and obviously, sandals are mainly a summer staple. That leaves us with flats or loafers -- and personally, the latter is my favorite! Loafers, for me, are the quintessential fall shoe. Maybe it's because I associate them with school and therefore back-to-school season, but whatever the case may be, I simply love them for fall weather. They pair wonderfully with a dress or skirt, and equally well with jeans and a sweater. Cotton scarves serve a dual purpose; they can help keep you warm (but not too warm!) and really elevate an outfit. They're perfect for the in-between weather when it's chilly but not cold enough to wear a true wool scarf. I also love neck scarves, as well - they look so chic and classic tied around the neck, especially with a striped tee! J.Crew has a great selection right now if you're looking to find one, and they're very inexpensive. I consider myself to be almost an Oxford shirt connoisseur (haha, just kidding!). I love them year-round, but they really come in handy during the fall. On warmer days, roll up the sleeves and tuck them into a sidewalk skirt with a pair of flats, and on cooler days pair them with chino pants and loafers. If it gets especially cold, they also layer perfectly under cardigans or sweaters! Speaking of sweaters, there's a special category that is essential for the transitional wardrobe. "Summerweight" sweaters (usually made of cotton or a cotton blend instead of wool) are really perfect for the summer-to-fall transition. Layer them or wear them alone, or tie them around your shoulders (a-la 1950's sweater sets!). I couldn't resist mentioning my favorite accessory that's appropriate for all seasons -- pearls! They are the perfect neutral and classic accessory to accompany any outfit. When in doubt during the summer-to-fall transition, pearls are my fall-back accessory because I know they'll pair perfectly with any outfit. Are you looking forward to the fall fashion season? I'm so excited! Love the LBD you featured!